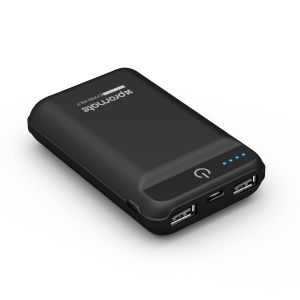 Charge your devices on-the-go with this powerful 10050mAh li-Ion backup battery: Card-10LT. Incredibly sleek & lightweight, Card-10LT is portable & easy to carry around. Charge any USB powered devices with the ultra-fast dual USB charging ports. With Card-10LT, remain powered up always. • Say goodbye to carrying around huge blocks of power and hello to portability. This Powerful 10050mAh Li-ion backup battery provides you with complete freedom to charge your smartphone or tablet anywhere. An outstanding feature of the Promate portable charger is that it includes two USB ports, both offering a 2.1A output for super-fast charging. This means you can use it to simultaneously charge a smartphone as well as a tablet including the iPad Air 2 or Samsung Galaxy Note 10.1. You can even charge two tablets simultaneously, making this power bank one of the most versatile portable chargers on the market today. • Another handy feature is the ultra-bright LED torch which illuminates dark areas and is a lifesaver in emergency situations like car breakdowns on the road.